A critical part of the Junior League of Washington’s (JLW) mission is to provide comprehensive and innovative training opportunities that equip our members to serve as civic leaders and advocates tackling critical issues, such as the League’s focus area of literacy. Through these member development initiatives, we are able to amplify our effect in the Washington, DC, community. 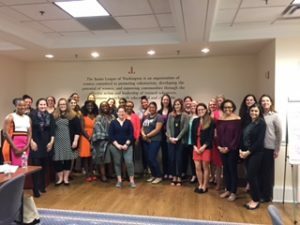 Every JLW volunteers receives training throughout her League career – from her first year as a new member, where she is given the tools she needs to succeed as a volunteer in the Washington, DC, community, to continuing educational opportunities offered to our sustaining members. The JLW Leadership Institute offers regular training in leadership skills to our members who are in or who are seeking leadership roles. These leadership development courses support community organizations in multiple areas: program volunteers, board leadership, community awareness, and public engagement. 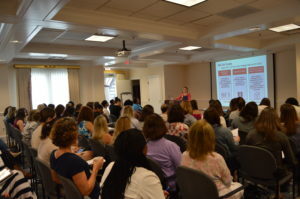 Get on Board: Since 2014, nearly 140 JLW members have completed the Get On Board training component of our Leadership Institute, which is specifically focused on equipping women to serve on community boards across Washington, DC. Organizational Development Institute (ODI) training: The Association of Junior Leagues International, Inc. (AJLI) hosts Organizational Development Institute (ODI) training three times a year, which is a series of educational training meetings that have demonstrated their effectiveness as informative, inspiring and innovative three-day weekend training programs. For each ODI training, JLW provides four members with an all-expenses paid opportunity to attend and learn leadership skills needed for future leaders. Twice a year, JLW Board members and chairs gather for training focused on developing their skills as leaders. Beyond leadership development, we ensure all members are equipped with the skills necessary to be effective volunteers. Every year, our Development & Training Committee hosts dozens of topic-specific seminars for our members. Recent subject areas have included: starting your own business; running for office; investing; volunteering with underserved populations; conflict resolution; developing your personal brand; and navigating negotiations. Much of our involvement in the community involves further extending training opportunities to those in need – such as through our Community Training Committee, which works with community organizations around DC to help clients in recovery programs achieve personal goals through training on life skills like financial literacy, budgeting, resume writing, and more. Not only are these training programs meaningful for our members, but they are also setting the standard for Junior League training. In 2017, JLW was honored with the Association of Junior League International’s Leadership Development Award, a $10,000 grant recognizing our leadership training. If you are interested in learning more about our member development programs, please email our Membership Development Council at mdc@jlw.org.